A fully illustrated contemporary cookbook featuring Australian native foods that is the perfect resource for any Aussie kitchen. This gorgeous illustrated, informative and contemporary cookbook and compendium of native foods will show you how to create truly Australian food and drinks at home. With a few small adjustments and a little experimentation you can prepare delicious food that is better for the Australian environment, is more sustainable and celebrates the amazing ingredients that are truly local. 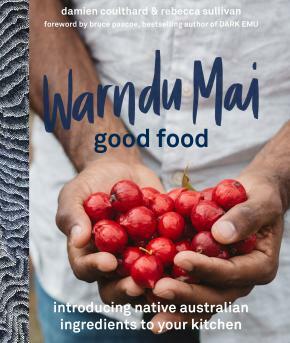 Warndu Mai (Good Food) contains information about seasonal availability, hints, tips and over 80 illustrated and accessible recipes showcasing Australian native foods, using ingredients such as Kakadu plum, native currants, finger lime and pepperberry to create unique dishes and treats - from wattleseed brownies, emu egg sponge cake and bunya nut pesto to native berry, cherry and lime cordial, strawberry gum pavlova and kangaroo carpaccio. It's a must-have for every kitchen.